I'm really hot on Blackest Night. It's revived my enthusiasm for DC Comics...it's even spurred me to collect all the single issues for that title, as well as Green Lantern, GLC, Flash Rebirth, etc. I can see why Barry Allen had to be revived. 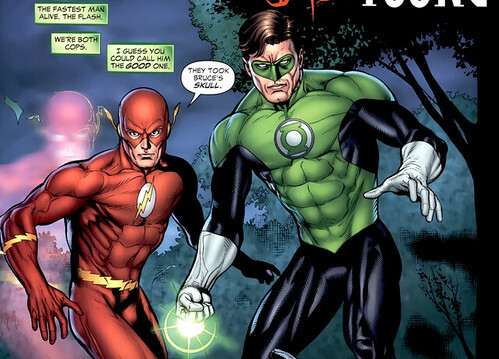 In scenes like the following, where a Flash needs to interact with Hal Jordan, it just feels better if it's Hal's peer, Barry. As they say in this splash page from Green Lantern #43, they are both cops, after all! But here's something even greater: the new speed effect for The Flash. It's a ghost effect showing the after images the Flash leaves in his wake. Ethan Van Sciver talked about this in one of his recent interviews, that he was charged with designing a new speed effect. 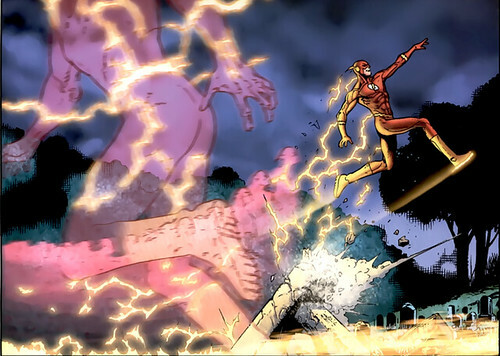 During the Golden Age, the Flash's speed effect was portrayed with multiple images of him doing something. In the Silver Age, Carmine Infantino drew the character with trailing speed lines that looked great in the 1960s. For the modern era, Wally West had those effects, plus a blurring of what was going on around him. Now with digital computer art, this new ghosting trick, combined with the traditional methods, really makes the Flash's power new and exciting. This panel by Ivan Reis shows you all of them. The colors also blur to give you that notion of speed. Even when the Flash isn't fighting, just turning his head, it still looks fantastic. The art in both Green Lantern books is really top notch. Now I am wondering who the artist will be for the regular Flash title, once Flash Rebirth is done. I'm thinking that DC Comics should tap Ivan Reis when Blackest Night is over. What do you think? Nuff said.